Within a very short while WhatsApp has managed to gather all possible appreciations. There might be some groups of people having complaints regarding the UI of the tool. Anyway, the good news is that you can download WhatsApp Plus for iPhone with flexibility of including tweaks the way you want. Through the process you can put more specs into the old WhatsApp. WhatsApp Plus is quite a sleek tool with much enhanced specs making it a lot more revamped than the original WhatApp. You can use the WhatsApp ++ features on your iPad, but you need to download WhatsApp for iPad first. 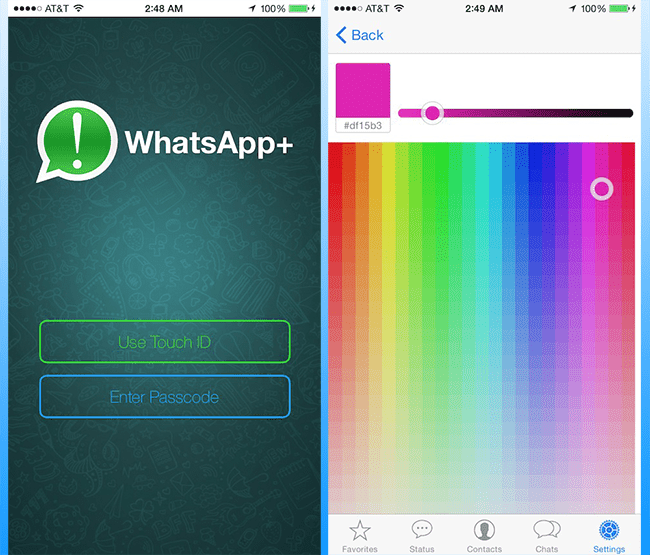 On this context, we present a thorough detail on installing the WhatsApp Plus for iPhone. These steps are quite easy to understand and practice as well. Concept is quite simple; you just need to download WhatsApp Plus (WhatsApp ++ Tweak) from Cydia. Hence, all you need is to to download the WhatsApp Plus (WhatsApp ++) tweak and install it. Let’s have a look at some of its interesting features. First, it is an immensely beautiful option coming with enough options for changing color, sizes, etc. This time you can hike the upload media capacity for sending the music or video files of bigger size. Your picture gets enhanced many folds through it. It is here to mention that the resolution gets hampered buy default for the pictures. However, the best part is that there will be no ads to make you feel hectic this time. These features save your precious time: Stealth Mode, Disable Read Receipts, Selective Read Receipts, Custom Theme, Full Profile Pic, Disable Delivery Receipts, Passcode / TouchID protect and more. Music sharing becomes a lot more easier being just a click away. The latest feature enables you to select a specific portion of a text document and send it to the destination. No need of going through lengthy processes this time as you and now take a dig at the status over the chat display from WhatsApp Plus. You can now have the option to conceal contact profile snaps and display phonebook photos over the chat screen. There is native theme viewer and download option. You can now have WhatsApp Plus users theme over the web as well. Revamps: The latest version includes base upgrade to the earlier App store version. Apart from this, the latest version has been provided with many revamps and fixed with many bugs. It means there is no D/C; you have the WhatsApp Plus now this time. 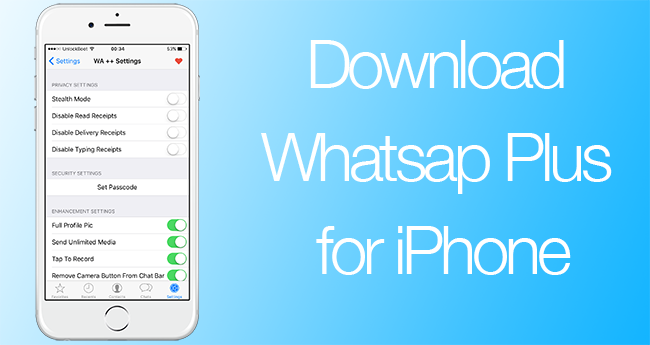 First you need to download WhatsApp Plus from Cydia. After installation open the WhatsApp app. Then go to Settings and you will see the WhatsApp Plus Settings option at the top. Now you can configure the extra options on your iPhone. Mark the points: Once the WhatsApp Plus for iPhone installation part is finished you just need to make the application functional through app drawer. You don’t need to go for extra registration for WhatsApp Plus upon being registered with WhatsApp available over your device.